For other places with the same name, see Ozyorsk. "City 40" redirects here. For the documentary about the city, see City 40 (film). 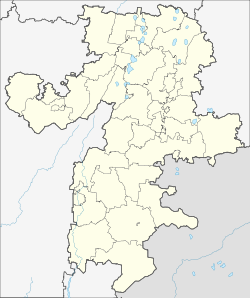 Ozyorsk or Ozersk (Russian: Озёрск) is a closed city in Chelyabinsk Oblast, Russia. The population was: 82,164 (2010 Census); 91,760 (2002 Census). The town was founded on the shores of Lake Irtyash in 1947. 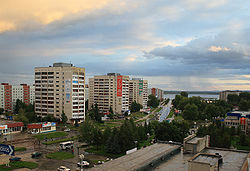 Until 1994, it was known as Chelyabinsk-65, and even earlier, as Chelyabinsk-40 (the digits are the last digits of the postal code, and the name is that of the nearest big city; which was a common practice of giving names to closed towns). Codenamed City 40, Ozersk was the birthplace of the Soviet nuclear weapons program after the Second World War. In 1994, it was granted town status and renamed Ozyorsk. Within the framework of administrative divisions, it is, together with six rural localities, incorporated as the Town of Ozyorsk—an administrative unit with the status equal to that of the districts. As a municipal division, the Town of Ozyorsk is incorporated as Ozyorsky Urban Okrug. Ozyorsk was and remains a closed town because of its proximity to the Mayak plant, one of the sources of Soviet plutonium during the Cold War, and now a Russian facility for processing nuclear waste and recycling nuclear material from decommissioned nuclear weapons. The plant itself covers an area of approximately 90 km² and employs about 15,000 people. The Mayak is primarily engaged in reprocessing of spent nuclear fuel from the nuclear submarines and icebreakers and from nuclear power plants. Commercially, it produces cobalt-60, iridium-192, carbon-14 and establishes conversion production with use of radiative technologies applying wasteless technologies. The town's coat of arms depicts a flame-colored salamander. Southern-Urals Construction Department (ЗАО "Южноуральское управление строительства") is another major enterprise. Its activities include construction for atomic industry needs, production of concrete constructions and construction materials. Main products of Plant of Wiring Products #2 (ЗАО "Завод электромонтажных изделий №2") are low-voltage devices for military-industrial establishments. Ozyorsk along with Richland, Washington, were the first two cities in the world to produce plutonium for use in cold war atomic bombs. The Chelyabinsk region has been reported as being one of the most polluted places on Earth, having previously been a center of production of weapons-grade plutonium. Ozyorsk and the surrounding countryside have been heavily contaminated by industrial pollution from the Mayak plutonium plant since the late 1940s. The Mayak plant was one of the largest producers of weapons-grade plutonium for the Soviet Union during much of the Cold War, particularly during the Soviet atomic bomb program. Built and operated with great haste and disregard for safety, between 1945 and 1957 the plant dumped and released large amounts of solid, liquid and gaseous radioactive material into the area immediately around the plant. Over time, the sum of radionuclide contamination is estimated to 2-3 times the release from the explosions from the Chernobyl accident. In 1957, the Mayak plant was the site of a major disaster, among all the other such accidents, releasing more radioactive contamination than Chernobyl, again. An improperly stored underground tank of high-level liquid nuclear waste exploded, contaminating thousands of square kilometres of territory, now known as the Eastern Ural Radioactive Trace (EURT). The matter was quietly and secretly covered up, and few either inside or outside Russia were aware of the full scope of the disaster until 1980. Before the 1957 accident, much of the waste was dumped into the Techa River, which it severely contaminated as well as residents of dozens of riverside villages such as Muslyumovo, who relied on the river as their sole source of drinking, washing and bathing water. After the 1957 accident, dumping in the Techa River officially ceased, but the waste material was dumped in convenient shallow lakes near the plant instead, of which 7 have been officially identified. Of particular concern is Lake Karachay, the closest lake to the plant (now notorious as the most contaminated place on Earth) where roughly 4.4 exabecquerels of high-level liquid waste (75-90% of the total radioactivity released by Chernobyl) was dumped and concentrated in the shallow 45-hectare (110-acre) lake over several decades. In addition to the radioactive risks, the airborne lead and particulate soot levels in Ozyorsk (along with much of the Ural industrial region) are also very high—roughly equal to the levels encountered along busy roadsides in the era predating unleaded gasoline and catalytic converters—due to the presence of numerous lead smelters. While the environmental impact of the disaster was immense, the contamination of the local populace was equally devastating. The average person living in Ozyorsk, 8 km from the Mayak Nuclear Facility, had a long term radioactive burden on their body at 17 Bq. Because of the large amounts of radioactive materials that were discharged into the atmosphere, over twenty two small towns throughout the region were evacuated. Some cities took two years for a full evacuation to take place. Reports indicated that humans living in the affected area during the time that the disaster took place and their offspring have developed problems with reproductive functions, mortality, age structure, and gender deformities. These populations were recorded at experiencing a radioactive exposure of 40-500 mSV. There are seventeen different cultural and public-service institutions. There are sixteen secondary schools, two schools specializing in the English language, one gymnasium, physics-mathematics lyceum, three professional colleges, Southern-Ural Polytechnical College, Music College, Ozyorsk Engineering Institute (an affiliate of National Research Nuclear University MEPhI), and affiliates of Yekaterinburg's and Chelyabinsk's universities. City 40 is a documentary film about the town, by Samira Goetschel, released in July 2016. ^ Law #287-ZO specifies that the borders of Ozyorsky Urban Okrug match the borders of the closed administrative-territorial formation of the town of Ozyorsk. ^ a b Samira Goetschel (July 20, 2016). "'The graveyard of the Earth': inside City 40, Russia's deadly nuclear secret". The Guardian. Retrieved July 25, 2016. ^ a b c William Langewiesche (April 29, 2008). The Atomic Bazaar: Dispatches from the Underground World of Nuclear Trafficking. Farrar, Straus and Giroux. pp. 33–. ISBN 978-1-4299-3434-3. ^ Mark Peplow (March 27, 2013). Military history:Dinner at the fission chips. Nature. ^ Rob Edwards (March 18, 2013). "The radioactive legacy of the search for plutopia". New Scientist. ^ Andrew Osborn (July 27, 2011). "How Chelyabinsk became synonymous with pollution". The Telegraph. Telegraph Media Group. Retrieved November 15, 2013. ^ Tabak, Faruk. "Allies As Rivals: The U.S., Europe and Japan in a Changing World-system". Retrieved August 9, 2016. Lake Karachay, a shallow pond about 45 hectares in area. ^ Suslova, K. G.; Khokhryakov, V. F.; Sokolova, A. B. (November 1, 2007). "Plutonium in the Ozyorsk population". Radiation Protection Dosimetry. 127 (1–4): 502–506. doi:10.1093/rpd/ncm303. ISSN 0144-8420. ^ a b Kostyuchenko, V.A. "Long-term irradiation effects in the population evacuated from the East-Urals radioactive trace area". Science of the Total Environment. 142 (1–2): 119–125. doi:10.1016/0048-9697(94)90080-9. Retrieved April 19, 2017. Законодательное Собрание Челябинской области. Закон №287-ЗО от 28 октября 2004 г. «О статусе и границах Озёрского городского округа», в ред. Закона №124-ЗО от 28 апреля 2011 г «О внесении изменений в Закон Челябинской области "О статусе и границах Озёрского городского округа"». Вступил в силу со дня официального опубликования. Опубликован: "Южноуральская панорама", спецвыпуск, 30 ноября 2004 г. (Legislative Assembly of Chelyabinsk Oblast. Law #287-ZO of October 28, 2004 On the Status and Borders of Ozyorsky Urban Okrug, as amended by the Law #124-ZO of April 28, 2011 On Amending the Law of Chelyabinsk Oblast "On the Status and Borders of Ozyorsky Urban Okrug". Effective as of the official publication date.). Kate Brown, Plutopia: Nuclear Families, Atomic Cities, and the Great Soviet and American Plutonium Disasters. New York: Oxford University Press, 2013.